FDR contracted polio in 1921 at the age of 39, and was paralyzed from the waist down. For the rest of his life, FDR was committed to finding a way to rehabilitate himself as well as others afflicted with infantile paralysis. In 1924, FDR visited a rundown spa in Warm Springs, Georgia where it was said that the buoyant mineral waters had therapeutic powers. After six weeks, he was convinced that he had made more progress in his rehabilitation than at any time in the previous three years. He built a home for himself at Warm Springs. In 1926 when the spa faced hardship, he purchased the facility for $200,000, creating a therapeutic center called the Georgia Warm Springs Foundation. It opened its doors to patients from all over the country, providing medical treatment and an opportunity to spend time with others suffering the effects of polio. FDR returned to politics, serving as Governor of New York from 1929-1932, and elected President in 1933. Even with the burdens of office, he regularly visited Warm Springs for treatment and rest, becoming known to the patients as “Dr. Roosevelt.” But the growing demands on the facility, and the increasing number of patients being treated there, required more money than FDR alone or a small number of contributors could provide. At the suggestion of a public relations consultant, business magnate and FDR political ally Henry L. Doherty launched the National Committee for Birthday Balls that sponsored a dance in every town across the nation, both to celebrate the President’s birthday but also to raise money for the Georgia Warm Springs Foundation. The first Birthday Ball was held in 1934, with 4,376 communities joining in 600 separate celebrations that raised over one million dollars for Warm Springs. Future Birthday Balls continued to raise about a million dollars per year, with contributions split between Warm Springs and the local communities where the balls were held. Soon, millions of dimes flooded the White House. In 1945, the annual March of Dimes campaign raised 18.9 million dollars for the National Foundation for Infantile Paralysis. Ultimately, the March of Dimes (as the National Foundation became known) financially supported the research and development of a polio vaccine by Jonas Salk in 1955, eradicating the disease throughout most of the world by the 1960s. Franklin Roosevelt’s dedication to finding a cure for polio benefited millions of children worldwide. But it was the participation of Americans across the nation in Birthday Balls that made the campaign a success. Their hard work and financial support supported the development of new methods of treatment to improve the lives of those stricken with polio and the creation of a vaccine to protect future generations from its devastation. 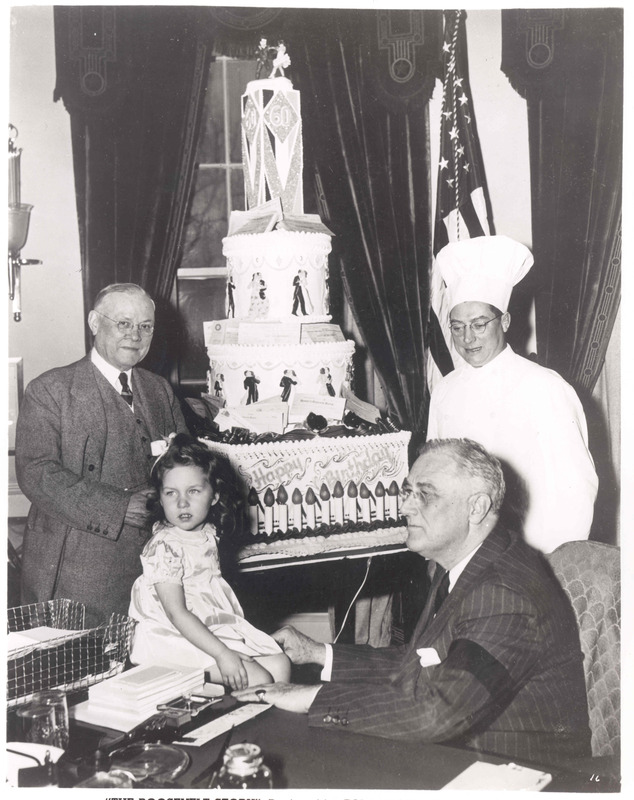 Although the Birthday Balls ended in 1945 with the death of President Roosevelt, both of their legacies live on in the March of Dimes. 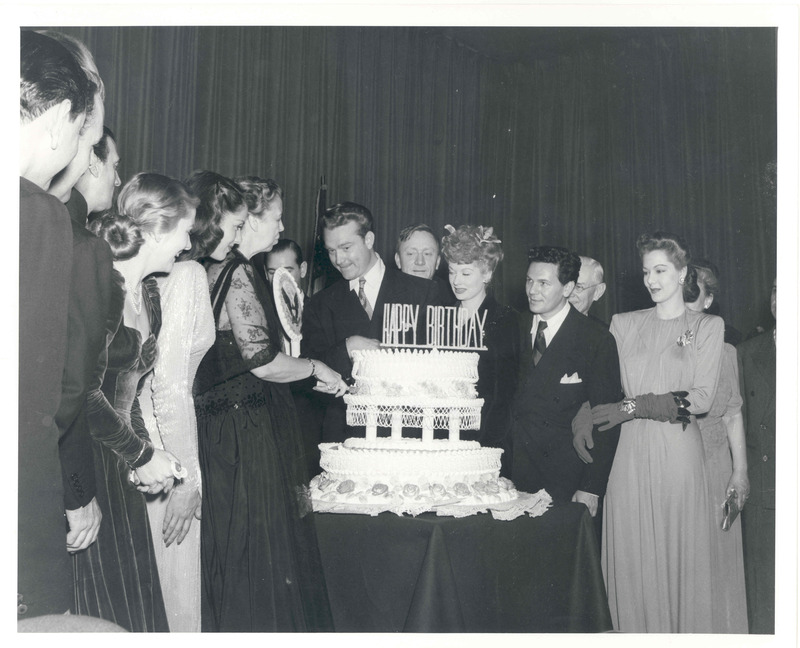 Eleanor at a FDR Birthday Ball at the Statler Hotel in Washington DC, with Red Skelton, William O. Douglas, Lucille Ball, John Garfield, and Maria Montez. January, 1944.